Welcome to my newest (yet still humble) Character Thread for the new forum. I hope to pick up where I left of from my previous Atomic Think Tank Second Edition and Third Edition Threads. 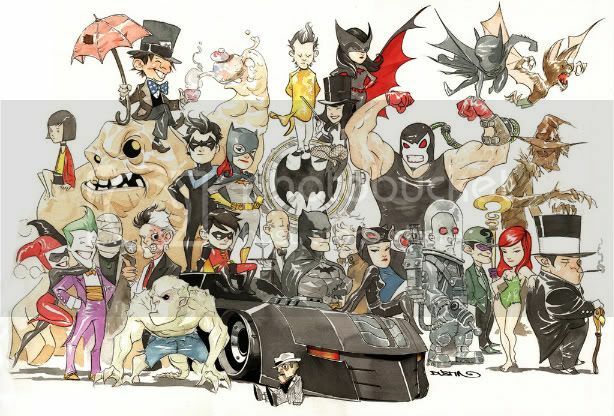 In those older threads I have many builds for the JLA, a general guide to Gotham City, a repository for stuff from my home-brew campaigns, random builds, GMing tips, and whatever else I felt like posting. With time, many of my old favorites will be brought over as well as any new stuff as the mood strikes. Sit back, pour yourself some coffee, and watch out for the bats. Critiques and comments always welcome, and so are good old fashioned nitpicks. Last edited by Batgirl III; 08-17-2015 at 09:55 AM. Doctor Marvel: I wear this symbol out or respect to your family, Mary Marvel, but I didn't seek your permission and I don't need your approval. No wizard told me the power of a magic word. No long lost brother shared his strength with me. Through the power of science and the strength of my own mind, I made myself. I summoned the lightning and made it tangible. I can hold it in my hands. Mary Marvel: Do you think you can control the power of the Gods? Doctor Marvel: The power of the Gods? No. Schrödinger. Halley. Archimedes. von Zach. Aristotle. Mendeleev. I have reached higher, only because I stand on the shoulders of giants. Captain Marvel: So... You've come to help. Doctor Marvel: In every way I can. Fame: Doctor Marvel maintains no secret identity and is fairly well-known to the public. Nemesis: The sociopath sorceress, Black Eve, is a recurring opponent. Relationships: Doctor Marvel has had some romantic entanglements, but nothing long-lasting as yet. Responsibility: Doctor Marvel feels a strong sense of responsibility to live up to the example of Captain Marvel and her ideals of the "Heroic Age." "The fundament of a superhero is the guy in tights saving innocent people from bad things. It's amazing how infrequently that seems to happen in superhero comics these days." Real Name: Maureen June Bromfield, D.E.Sc ., Psy.D., D.O. Legal Status: Citizen of the United States with no criminal record. Dr. Maureen Bromfield, better known to her friends and family by her middle name, June, has always been a fan of superheroes. As a kid growing up in Fawcett City, she idolized the local heroes - the Marvel Family. Her parents' bitter divorce when she was ten years old began to shake her childhood faith in heroism, and so did the long and messy custody battle that followed. Custody matters were finally settled the week of her eleventh birthday, with sole custody of June given to her engineer father, who promptly packed up June and her younger brothers (twins Tommy and Jake) and relocated the entire family to Gotham City. Needless to say, Gotham City did not suit June at all. The city was dark, gloomy, and grey; her father spent most of his time at work, and paid little attention to June or her younger brothers. June took it upon herself to replace their mother -- she did most of the cooking, helped the boys with their schoolwork, and kept them entertained for hours by spinning tall tales of the great adventures of the superheroes she so loved: Superman, Wonder Woman, and (of course) Captain Marvel. Eventually her younger brothers grew up, and so did she. June pursued her interests in science -- possibly chasing after her father -- and her brothers pursued their own interests; enlisting in the Marine Corps -- possibly still chasing the tales of heroes their big sister had told them all their lives. Despite her standoffish relationship with her father, June inheireted his knack for electrical engineering and advanced technology. She did very well in school, and was accepted to many of the best colleges. She eventually earned her firest doctorate ar age 26, and was offered many promising jobs in R&D by Lex Corp, Wayne Tech, and other high tech firms. On her brothers' advice, she turned them all down, hoping to make the workld a better place as a humble high school science teacher. Tommy and Jake were sent to Iraq, which caused the rift between June and her father to grow ever wider. During one argument with her father, shortly after the twins deployment, her father let slip that he hadn't been working for Wayne Tech at all during their time in gotham, but instead of one of the leading weapons engineers at a small and ultra-secretice branch of Lex Corps. Father and daught would speak again for over a year, not until Jake's funeral in 2007. Father and daughter reconciled on that day - he revealed that he was dying of an inoperable cancer and she told him about her great secret desire, to truly make a difference in the world. Feeling that things had grown to dark during the 2006 disappearnce of Superman, Wonder Woman, and even the Batman, in the wake of yet another in a string of crisises, June vowws to make a difference in the lives of her students and her city. With the help of her father, June has created one of the most powerful weapons the world has ever seen: a pair of rings which grant its wearer incredible powers almost rivaling that of the Marvel Family. Doctor Marvel debuted shortly after the return of Superman, Wonder Woman, and the Batman; She operated throughout the American North East in addition to her native Gotham City. She rarely came into contact with the Batman or his close allies, but her activities were mostly limited to rescue, emergency response, and direct intervention in supervillain crimes -- Doctor Marvel very rarely "patrols" -- and a sort of mutal agreement to stay out of each others way developed between Marvel and the Batman. Doctor Marvel has been operating as a hero for nearly ten years, and has grown into an experienced and confident hero. ► Doctor Marvel was a character I originally built under M&M2e rules, both as an initial PL8 and then advanced to PL10. It's been a looong time since I got to play Mutants & Masterminds, but a new game might be starting soon so I have tried to update her for the new rules. I hope I've done okay and would appreciate any feedback you all can give. I used to pride myself on my mastery of the M&M2e rules, but having only played one game of 3e just after it launched -- and barely having a chance to really read the book or follow these forums -- I admit to being way behind the curve. ► The concept is still pretty simple: Ultra-Boy meets Captain Marvel by way of Green Lantern. Each of the two "Rings of Wonder" is an array with seven alternate powers -- each coorsponding to one of the magical traits that Captain Marvel gains from the wizard Shazam -- but Doctor Marvel can only use two powers at a time, one from each ring, and they cannot overlap. Sailor Moon: For Love and Justice, the pretty sailor-suited soldier, Sailor Moon! In the name of the Moon, I will punish you! Identity: Typical secret identity tropes abound. Relationships: It's a shoujo romance series, let's just say this comes up a lot! Known in Japan as Bishoujo Senshi Sailor Moon (and given not-quite-literal English title of "Pretty Soldier Sailor Moon"), Sailor Moon is a multimedia franchise that fused the Super-Hero Team ("Sentai") and Magical Girl genres. The series started as a manga and was later adapted into an anime. Created by pharmacist-turned-manga author Naoko Takeuchi, Sailor Moon lasted for five seasons, three motion pictures, and a number of TV specials, becoming its own cottage industry in the process. Introduced to North America in the mid-1990s, a strong argument can be made that the English-dub of this show, along with Robotech, Dragonball, Star Blazers, and Voltron, are more or less the reason that America expereinced the anime boom of the late-1990s and 2000s. One of the things about looking at series from the past: It's good to remember the historical context. There had been magical girls, before this. They transformed into pretty clothes and granted wishes (that generally went humorously wrong), or transformed into duplicates of their older sisters to find out if the boy that they had a crush on liked them. Pure Shoujo. And there were superhero shows. Some of them even had a token female character that wasn't a stay-at-home love interest. And then there was Sailor Moon, in which the clumsy, awkward girl who has hopeless crushes on the cute, unattainable guy teams up with her BFFs to blow the living crap out of demons with their magical powers. Nobody else had done this before. Tsukino Usagi is just your average everyday schoolgirl living in mid-20th-century Tokyo, a well-intentioned, but underachieving crybaby... who discovers she is the reincarnation of the Princess of the Moon and destined to become the queen regnant of a new Silver Millennium called Crystal Tokyo in the 30th Century. Usagi can transofrom into the Champion of Justice, Sailor Moon, the leader of the Sailor Senshi, and one of the most powerful as well. 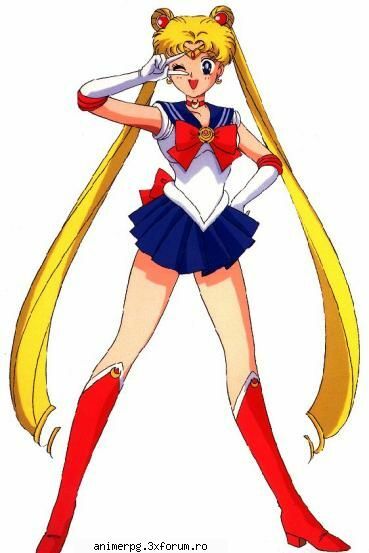 Initially, Usagi refused to accept her role as Sailor Moon, but eventually realized that she could not escape her destiny and embraced her responisbility to mankind. Although Usagi possesses many qualities unbecoming her status — she is lazy, clumsy, gluttonous, and often rather ditzy — her heart and soul are pure, and she has sacrificed herself many times for others. Usagi may drool over every cute boy she meets — she is 14 —but her heart belongs to Mamoru. Design Notes ► Sailor Moon has the Ritualist Advantage, not because she's going to whip out a spellbook and start conjuring demons, but because she acts as the focal point as source of power for all sorts of special effects when combined with the other Sailor Senshi: teleportation, dimensional travel, and more. These generally happen but once or twice per season, however. Last edited by Batgirl III; 08-04-2014 at 09:31 AM. 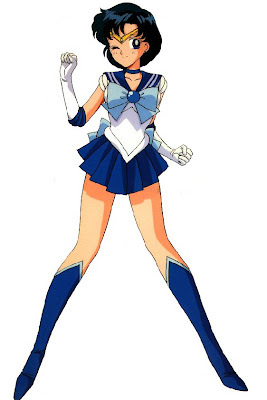 Sailor Mercury: Agent of Love and Exams, the pretty sailor suited soldier Sailor Mercury! Douse yourself in water, and repent! Identity, Relationships and Responsibility: as per standard genre convention. Power Loss: Without access to her Henshin Pen, a pen-shaped wand which Ami generally keeps in her pocket, she cannot transform into Sailor Mercury and has no powers. To activate the wand, Ami yells the phrase "Mercury Power Make Up!" and transforms into Sailor Mercury. Mizuno Ami is an extremely smart student attending Juuban Junior High, the gossip among her classmates is that she has an IQ of 300! Ami was always the top ranking student at her school, and even top in the nation! Though, she doesn't brag about how smart she is. Ami lives in an apartment with her mother (a doctor at Juuban Second General Hospital), and Ami also has the same dream of becoming a doctor. Ami is skilled in computers (excellent at video games), swimming, and even playing chess. Ami is very quiet and usually keeps to herself and finds it difficult to cope when other students tease her. Usagi helps with these days of depression by letting her know that she is always there for her, and for this Ami is thankful to have met Usagi. Although, when Ami first transferred to Juuban Junior High School, she was looked down upon because of her incredible intelligence, & Luna suspected her as being an agent of the Dark Kingdom. Though in fact, Ami was the total opposite & turned out being one of the Soldiers of the Four Guardian Deities. The Soldier of intelligence protected by the star of Mercury, Sailor Mercury. Design Notes ► My favorite of the original cast, and third favorite in the series overall. Ami is of limited use in a fight she's a focused debuffer, although given the team-focus of the sentai genre this isn't that limiting. Her intellect and skills make her very useful in the rest of the adventure when the monster(s) need to be found or their weaknesses discovered. Last edited by Batgirl III; 08-04-2014 at 09:30 AM. Sailor Jupiter: Agent of Love and Courage, the pretty sailor suited soldier Sailor Jupiter! In the name of Jupiter, I will punish you! Reputation: Her overall looks (very long school skirt, jewelry, wavy hair) and her bad reputation at school comes from the perception of many that she is Sukeban (think 1950's American sterotype "juvenile delinquent," only as a Japanese girl). However, Makoto is really rather something of a girly-girl, and among the core-cast she is the best cook, best seamstress, and best housekeeper of them, and wants to be a florist when she grows up! Power Loss: Without access to her Henshin Pen, a pen-shaped wand which Makoto generally keeps in her pocket, she cannot transform into Sailor Jupiter and has no powers. To activate the wand, Makoto yells the phrase "Jupiter Power Make Up!" and transforms into Sailor Jupiter. Kino Makoto was a transfer student who was kicked out of her previous school for fighting. Usagi was the first from Juuban Junior High to befriend her, and they have had a special bond ever since then. Makoto lives by herself in an apartment which she alone maintains (her parents died in a plane crash, but this is only mentioned in the manga, the anime implies that she is a "satelite child" and her parents live in another city). This has made her a very independent girl, but this attitude can sometimes cause Makoto to be very distant. When fighting against one of the Group of Seven Yōma, Sailor Moon discovered that Mako-chan was the Sailor Senshi of the planet Jupiter, Sailor Jupiter. With her brute strength and also powerful lightning attacks, she helps the Sailor Senshi when they are in battle with tough enemies by taking the offense. Design Notes ► Makoto was something of a flat character* in the original manga and 1990's anime, at least in my opinion. However, she became one of my favorites in the live-action series, which spent more time dealing with the out-of-costume lives of the ensemble cast. * Personality-wise. She's got the largest bust of any of the Sailor Senshi. Last edited by Batgirl III; 08-06-2014 at 01:27 AM. My daughter LOVED Sailor Moon back in the day. She tried to get me to watch it but that was in my anime hating days so I never gave it a chance. Now that I have seen the error of my ways thanks to Kreuz's urging me to watch Full Metal Alchemist a few years back (apparently it was a gateway anime ), I will have to check it out with an open mind. Sailor Moon is indeed the Bee's Knees; I worshiped it as a teen, and it made me an anime fan overnight. Sailor Mars was my girlfriend . Last edited by Jabroniville; 08-05-2014 at 11:14 PM. Even if you don't give any of the other Sailor Senshi the Attractive advantage, you have to give it to Sailor Mars. I mean, in the new Sailor Moon Crystal series when Usagi first sees her, she gets hearts in her eyes and says she is so beautiful. And I would think out of all the Sailor Scouts, Jupiter would have higher than a 1 Strength, Fighting and Stamina by the Sailor Moon S series. She is very strong for her age and their toughest fighter.